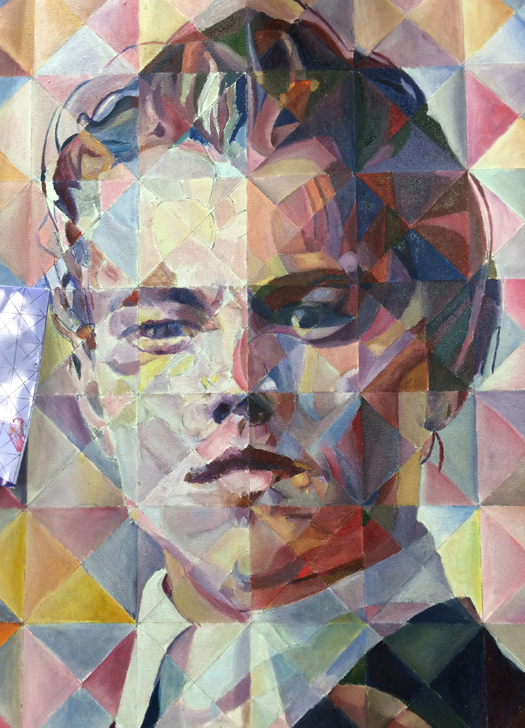 in less than two hours! 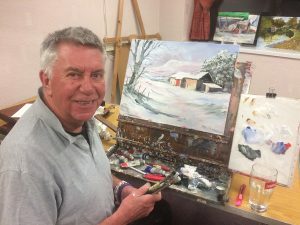 Lodge Artists were fortunate in persuading this popular artist to call in on his way back from Southport to Pontefract to give one of his rare demonstrations (these days). 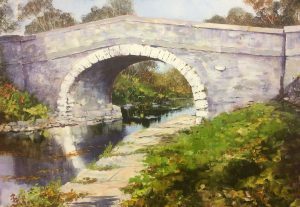 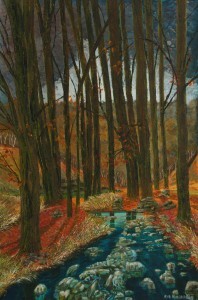 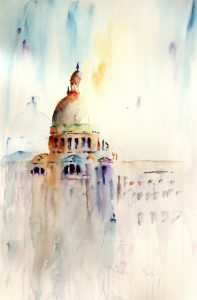 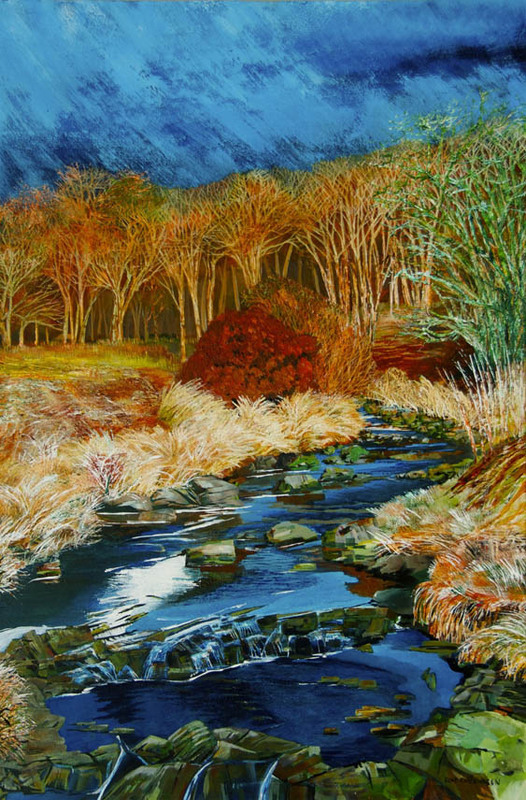 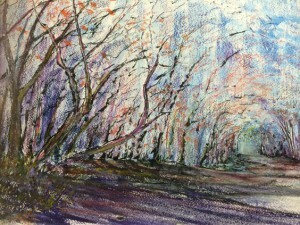 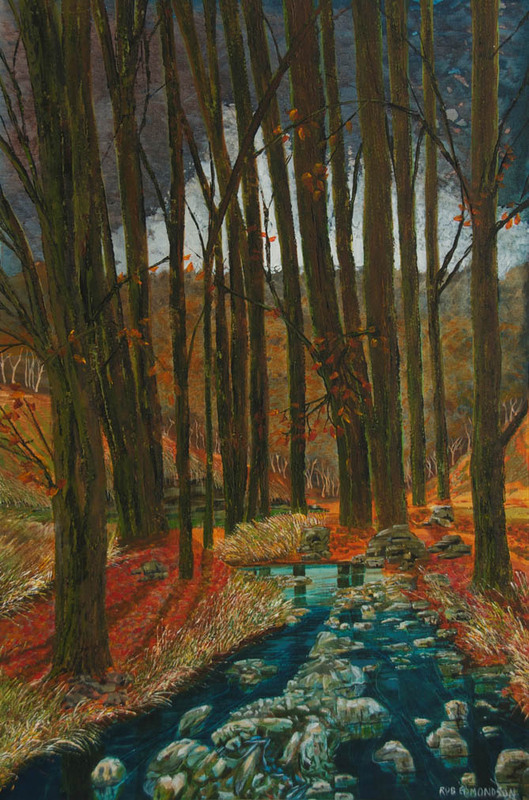 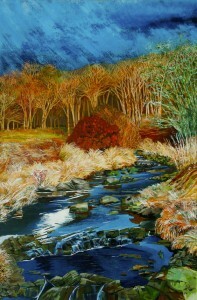 He shared tales from his background and career in art as well as his techniques and choice of materials while producing a delicate watercolour with autumn colours. 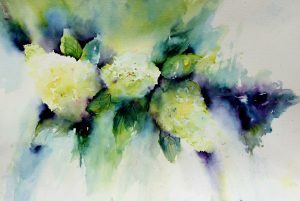 We hope to arrange a workshop in Spring to learn more. 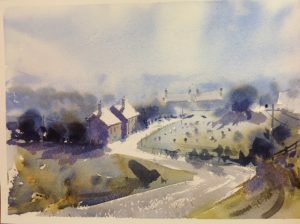 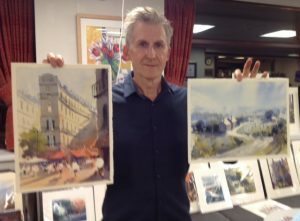 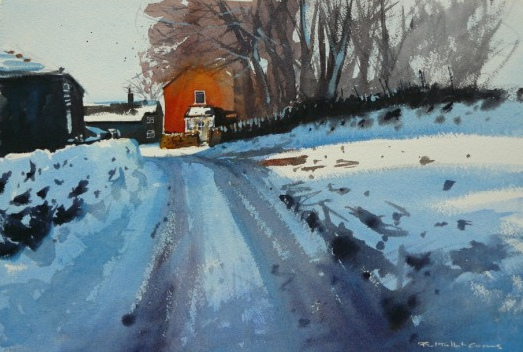 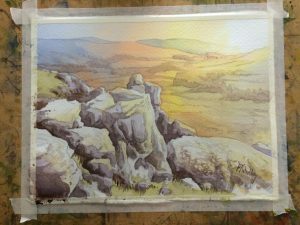 Lodge members were treated to a fabulous demo by Wigan artist, Les Nixon, resulting in these two watercolours, well within the two hour session. 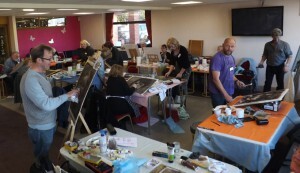 Find out about his water colour classes Fridays 10am – 12noon at Sunshine House, Wellington Street, Wigan WN1 3SA. 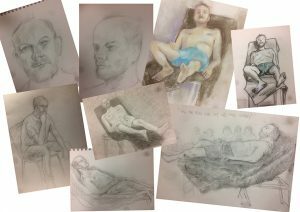 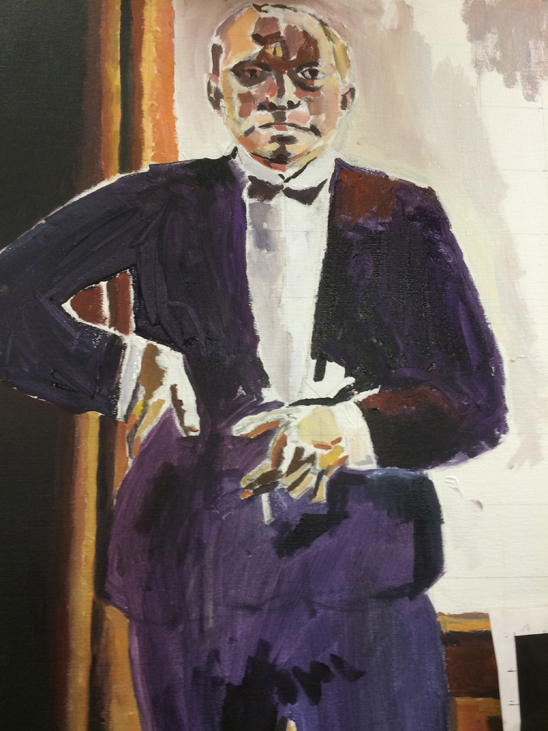 Members made 4 sketches of life model Ian Richardson during the evening meeting. 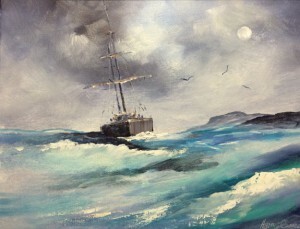 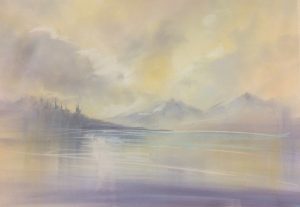 Susanna demonstrated her techniques using Windsor & Newton ‘creamy’ acrylics to produce atmospheric seascapes. 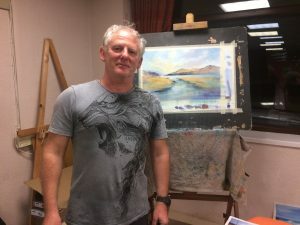 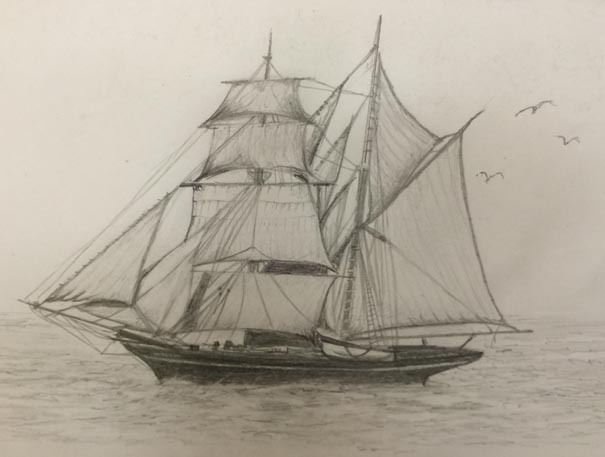 Lodge members were treated to a demo by talented local artist Liam Dickinson this week. 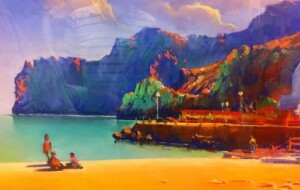 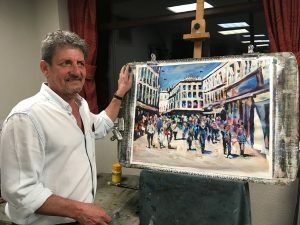 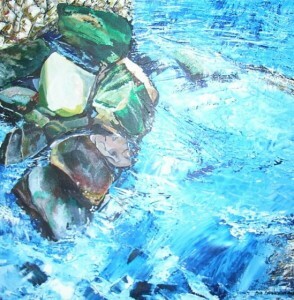 His technique was to put down the colours loosely in acrylics and then work into it in oils. 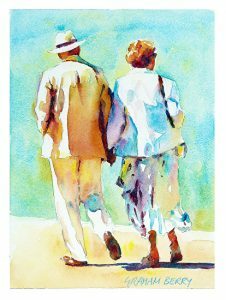 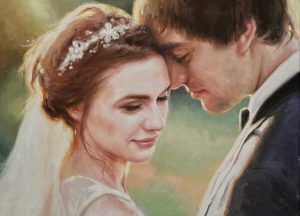 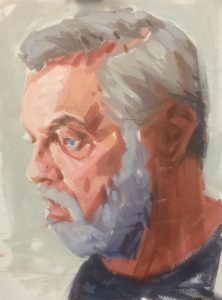 Ever popular visiting artist Gerry Halpin demonstrated how he composes figurative paintings using his collection of sketches and photographs, with a simplified style and carefully planned colour palette. He urged members to have a go and have fun with it. 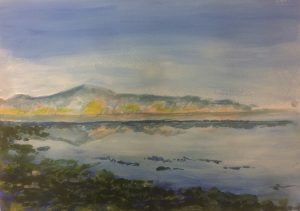 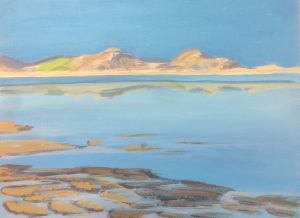 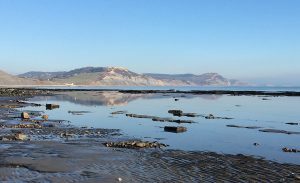 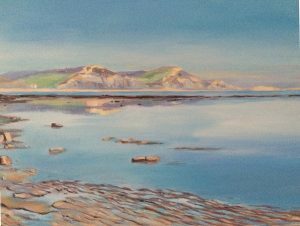 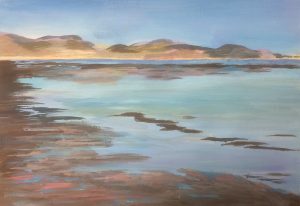 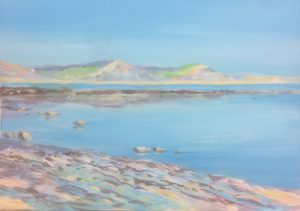 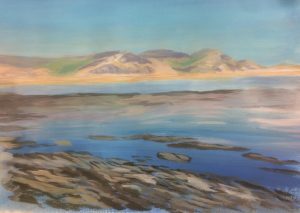 Member Jackie Williams took a Workalong session to produce a painting using her photo of Lyme Bay in Dorset as reference, with a limited palette of acrylics and a loose technique. 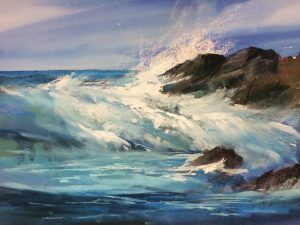 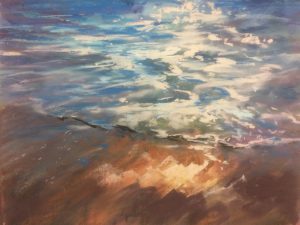 Les produced two fabulous mixed media seascapes, combining inks with soft pastels, showing how to work with your own bespoke coloured background on quality pastel paper. 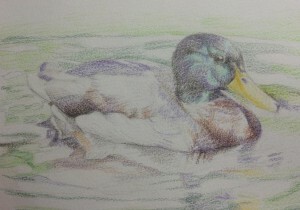 A third (below) was using pan pastels and was done in just 10 minutes! 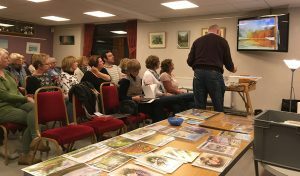 A large audience of members and guests enjoyed watching Paul create this impressive watercolour explaining each detail of his technique and materials used. 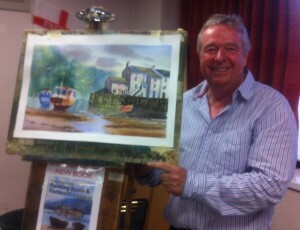 Amazing demo by Tony Barrow! Guests and members were bowled over once again by Tony Barrow’s great work, producing two fabulous pieces during the session. 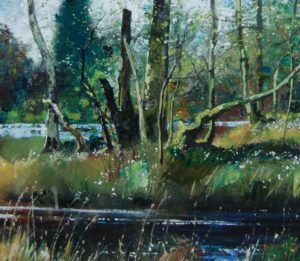 Graham’s paintings are inspired by the effect of light and shadow on our environment, creating dynamic shapes and colours. 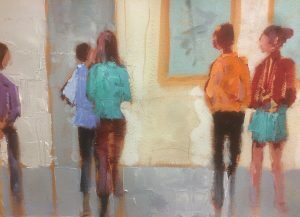 He especially enjoys painting people going about their everyday lives. 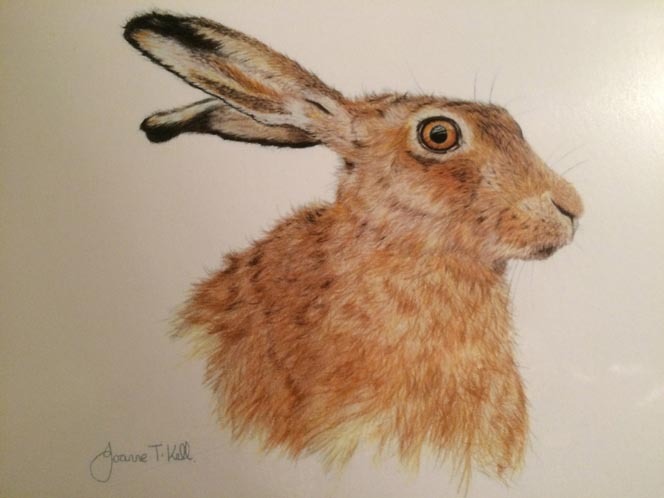 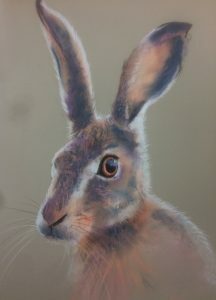 Elise gave members a fascinating demonstration of her skills with pastels, producing this beautiful hare during the two hour session. 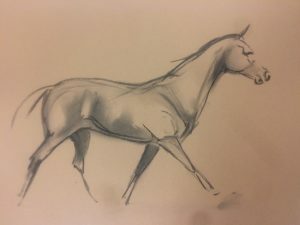 She later did this sketch of a horse with no reference in about 10 minutes flat! 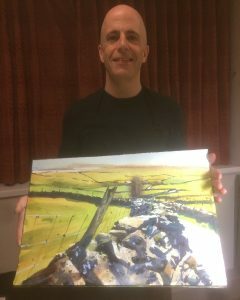 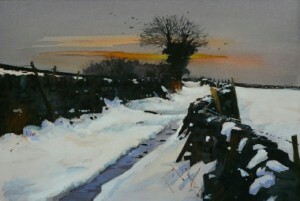 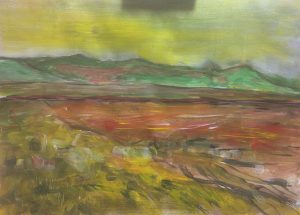 Harry demonstrated his skills in oil painting, providing a humorous commentary with tips and techniques, with an interpretation of a recent sketch he made en pleine air near Pendle Hill. 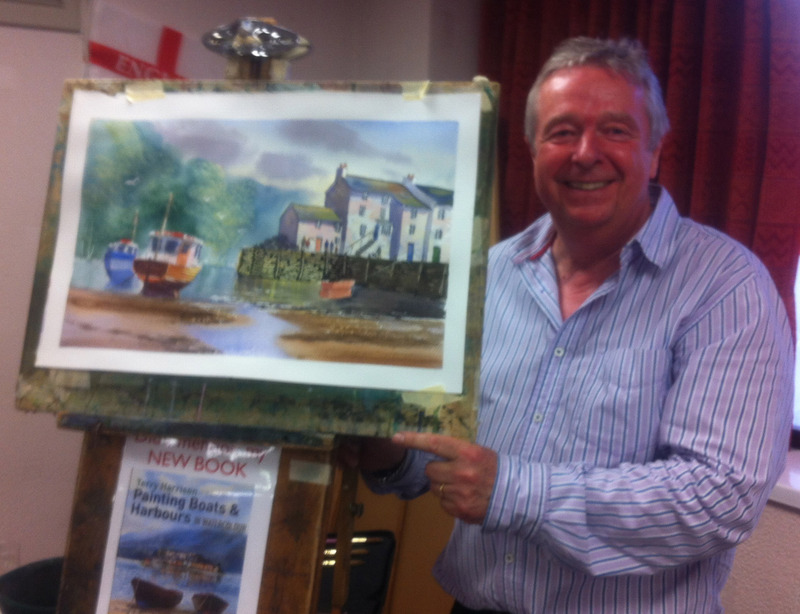 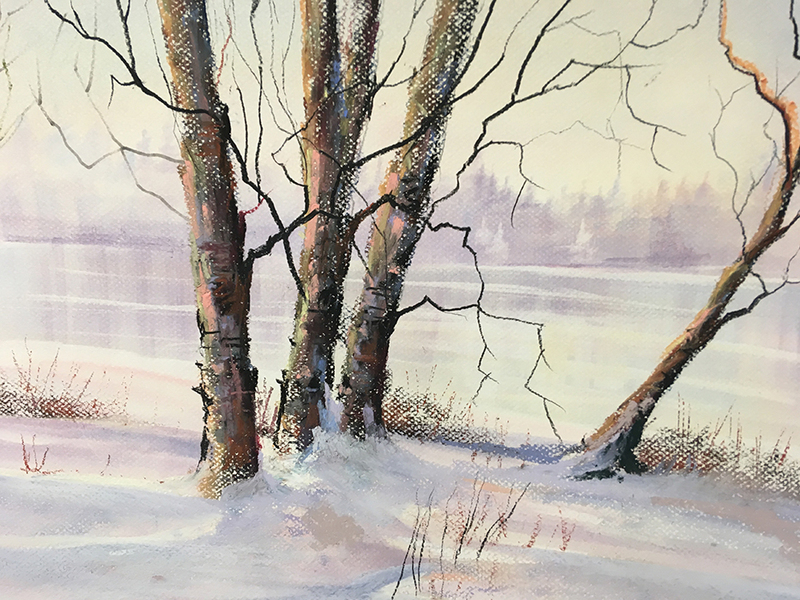 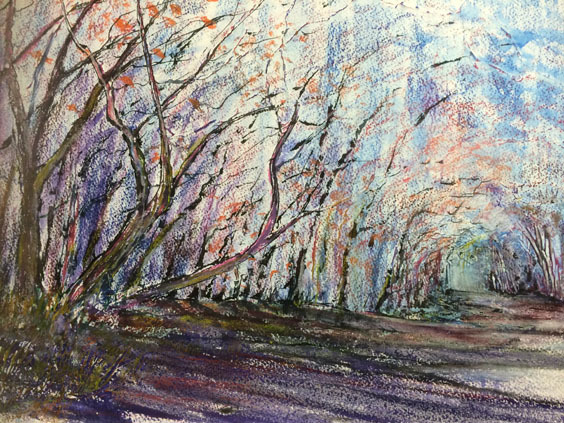 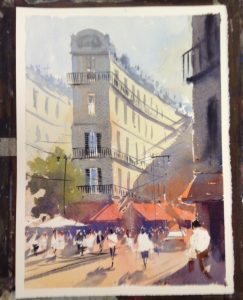 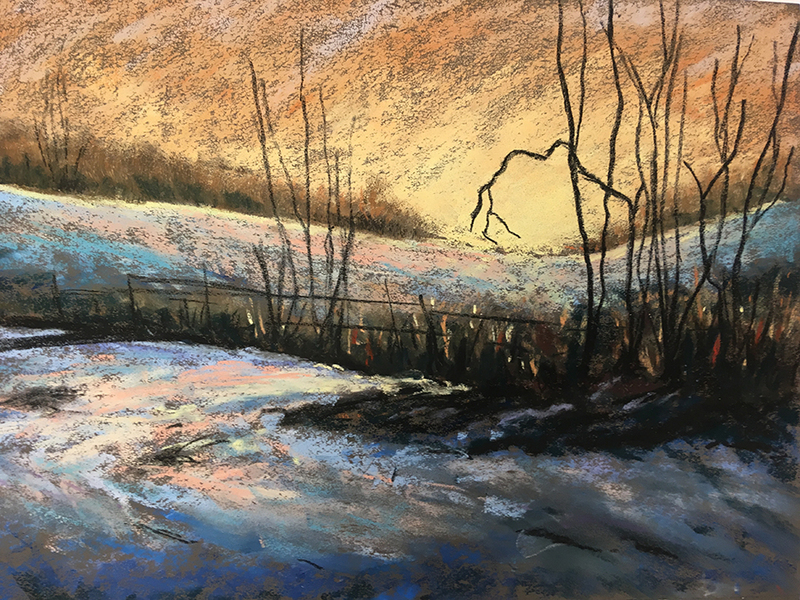 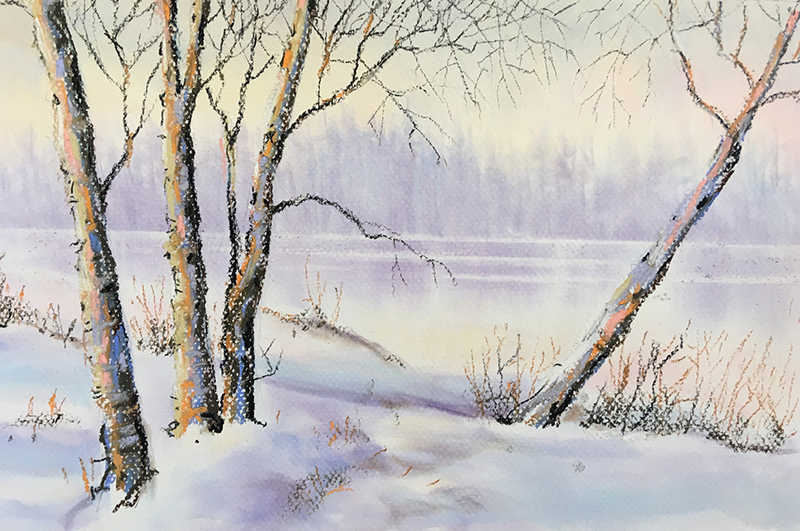 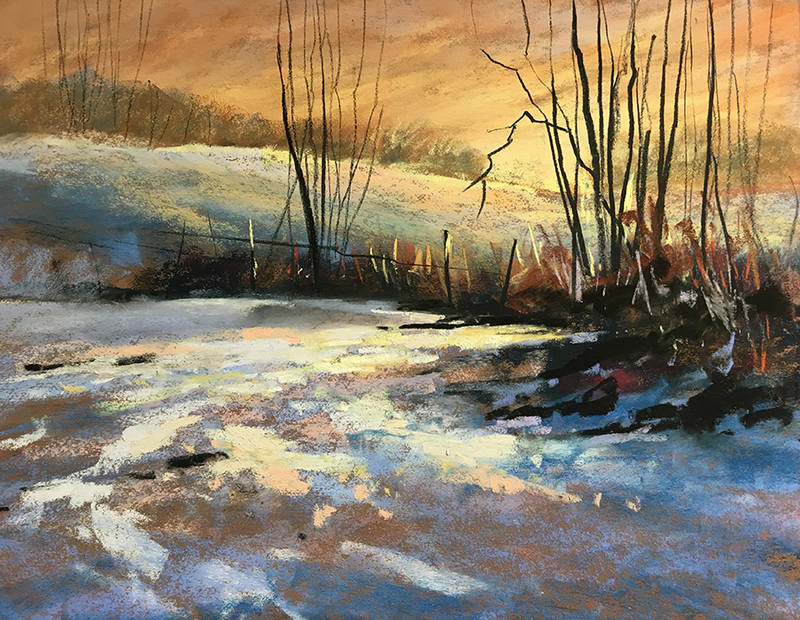 Les Darlow loves pan pastels and he shared his enthusiasm for them with Lodge members at our recent demo. 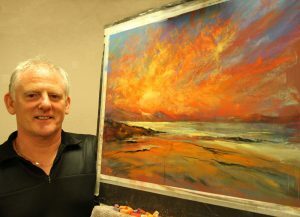 During the session he produced two stunning images with magnificent skies and crashing waves (complete with sound effects!). 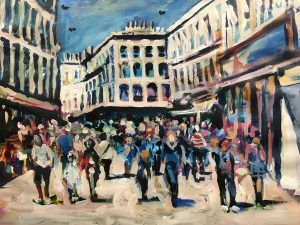 October Demonstration – Edward Foster. 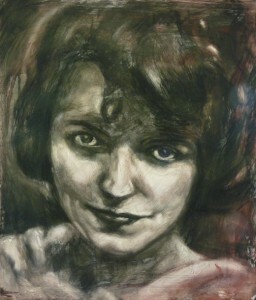 An unusual approach to drawing and painting direct from the mind. 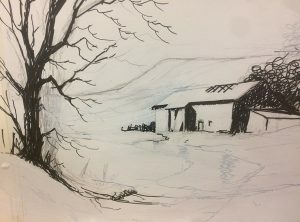 Inspiration comes from any recent notable experience which forms the main subject which is then added to by clearing the mind and the pencil is then used to elaborate the image randomly (doodling) until an image is developed and refined to produce a natural abstract picture. 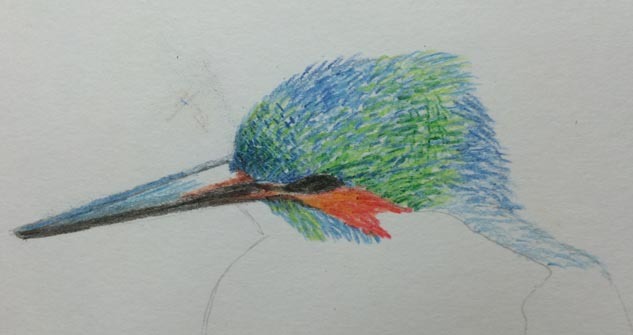 The workalong consisted of volunteers starting with a part image chosen from one of Ed’s sample drawings and each participant produced a completely different natural image with some very surprising and intriguing results. 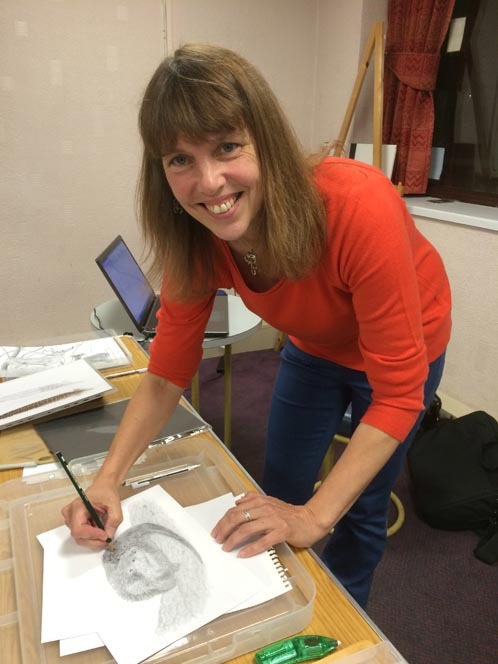 Each participant was given a piece of A4 paper and a pencil to start with and the resulting drawings were explained by the artist! 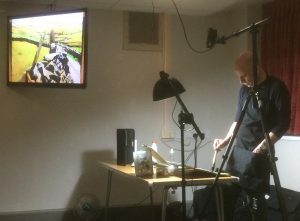 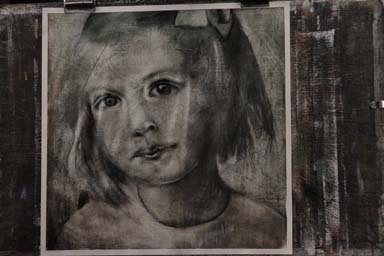 The demo consisted of working in water colours directly from a black and white misty photograph to demonstrate the theory of working from indistinct tonal images. 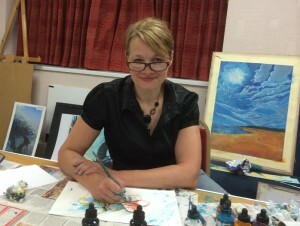 She also suggested using any colours from a choice of three or four. 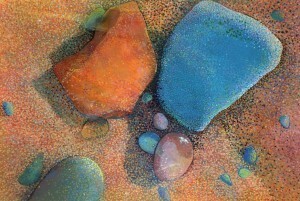 This included working with only one colour in various tones for best effect. 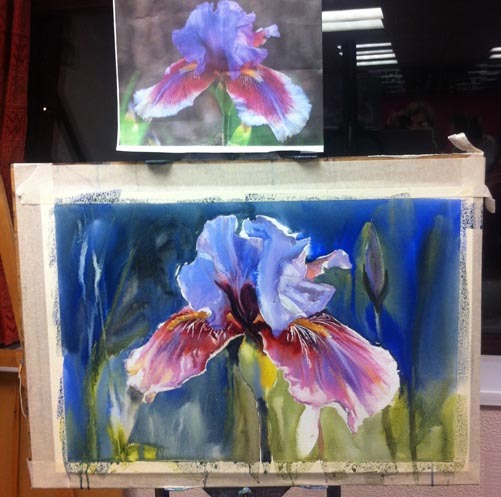 Members found it very informative and a new look at basic techniques. 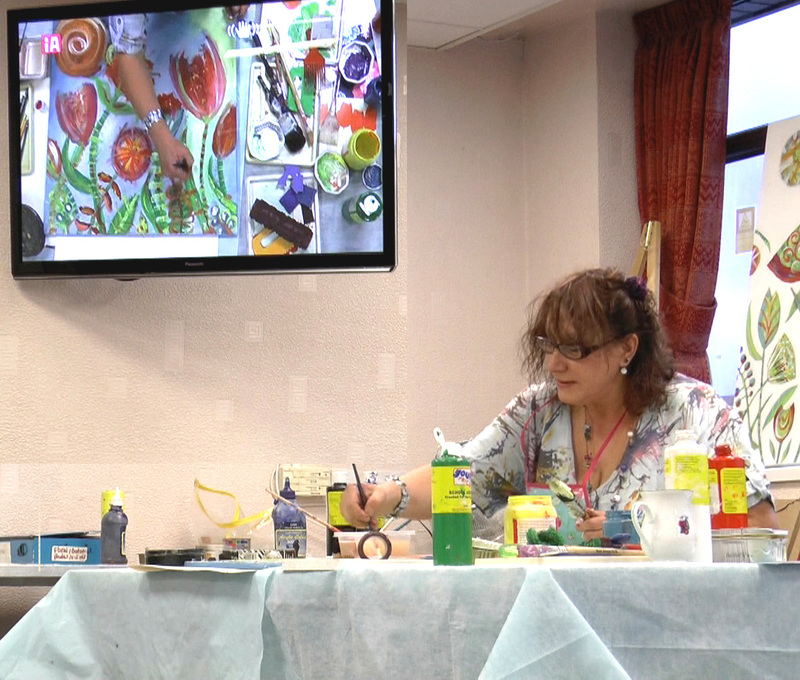 Judith showed us how to modify these techniques to get the best effects, with the minimum of effort. 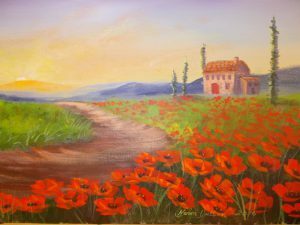 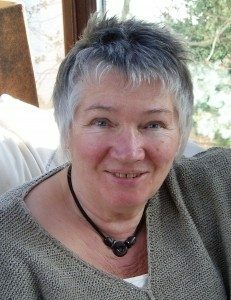 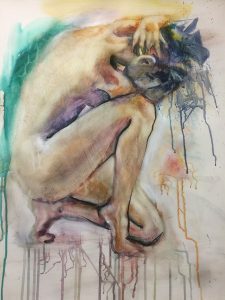 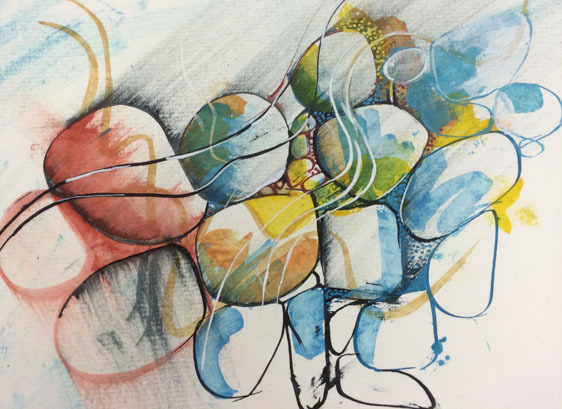 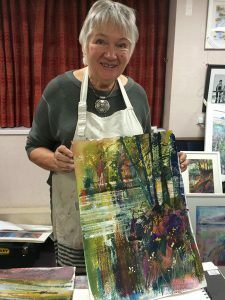 Frances is bordering on the abstract side in her painting and she showed us how to not be afraid to lay paint on the paper or canvas and the effects that were shown when she rubbed off areas, scratched into the paint and generally enjoyed the creative process. 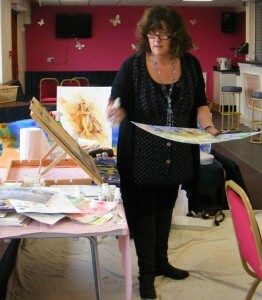 Leanne Ellis was with us on 21st June demonstrating her techniques for producing landscapes on paper and canvas using acrylics. 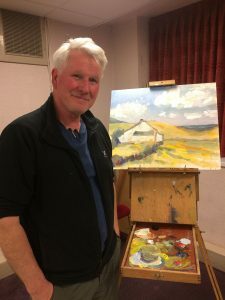 Rob showed us how he builds and mixes colour on the paint surface with underpainting and brush strokes to create a simple landscape from his library of sketches of local scenes. 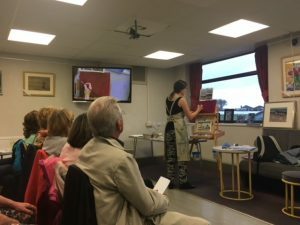 Lodge member, Anne Houghton, lead a discussion about keeping a sketchbook, having encouraged members to bring their own books in to share ideas. 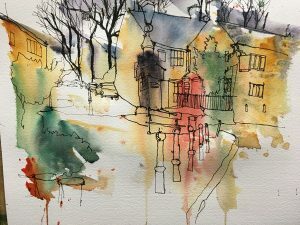 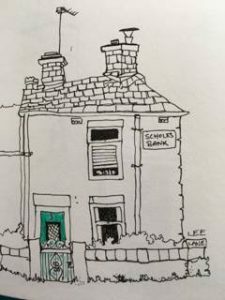 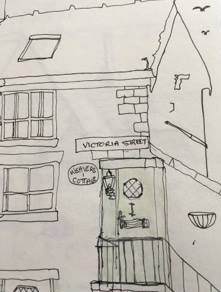 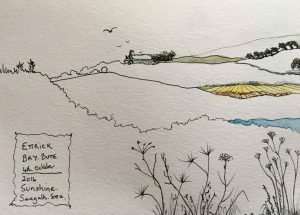 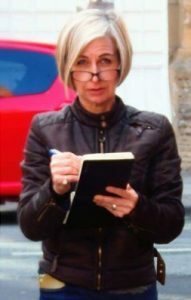 This was a very enjoyable meeting and Anne’s own sketches showed how she records her observations, with great economy of line and colour, to successfully conjure up the atmosphere and character of her chosen subjects. 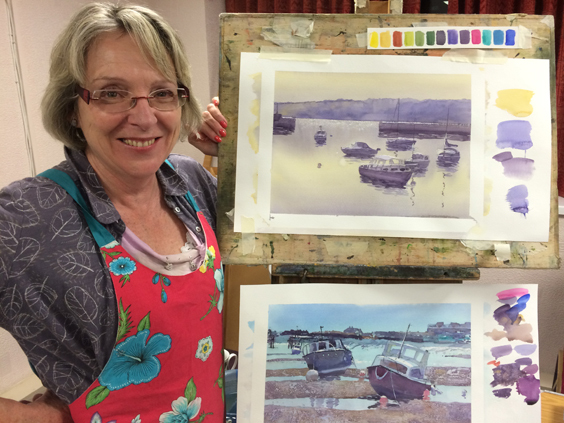 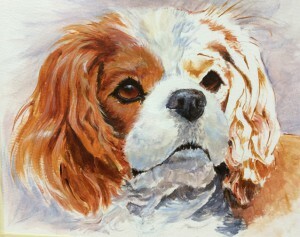 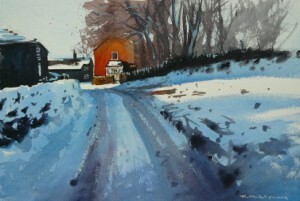 Fiona never fails to impress Lodge Artists members with her skills with watercolour. 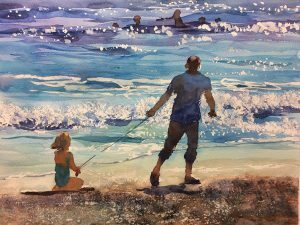 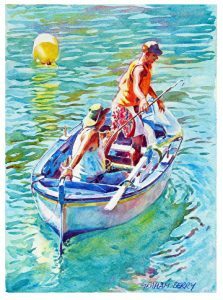 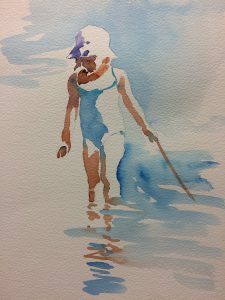 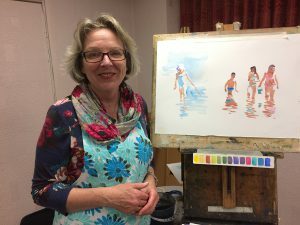 This time she produced a stunning image of figures by the sea, which showed how a piece painted in the studio can look like it has been painted ‘en pleine air’, showing the use of masking fluid and texture in her characteristic style. 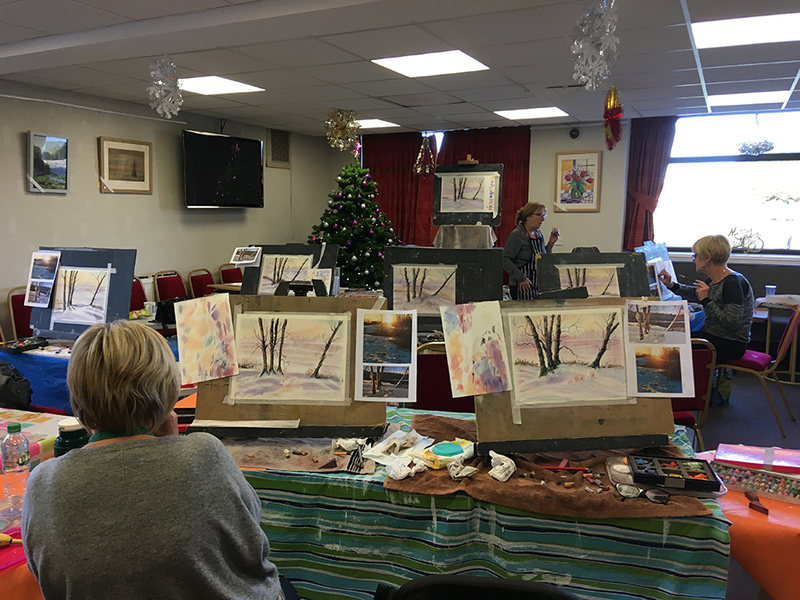 She also showed us how to sketch with watercolour, avoiding the use of outlines and using the shape of her brush to create the forms. 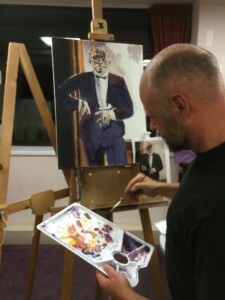 The painting and two sketches were all completed within the evening session. 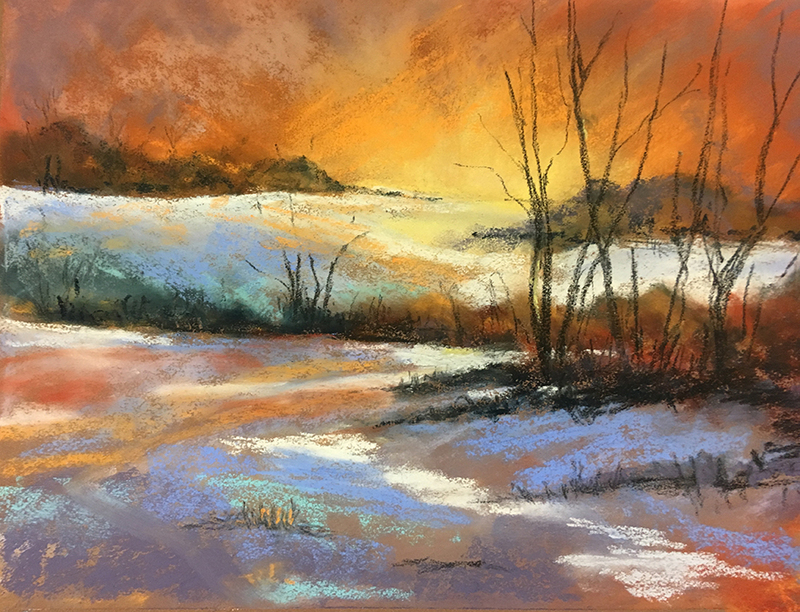 Anthony Barrow working with Pastels. 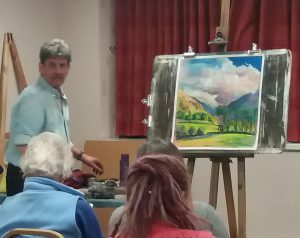 Members enjoyed a demonstration by Anthony Barrow on how to create stunning landscapes in pastels. Frances gave a demonstration to show how she achieves so much texture and vibrant colour in her work. 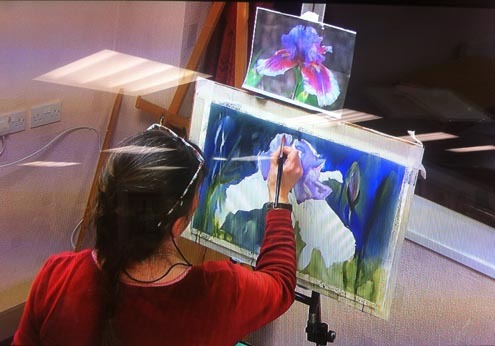 She started 3 different paintings during the short session and showed us many of her brilliant works in acrylic and watercolour as well. 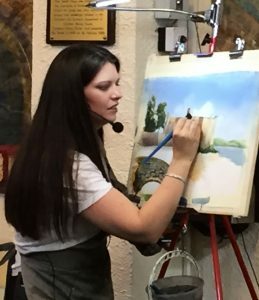 Very inspiring! 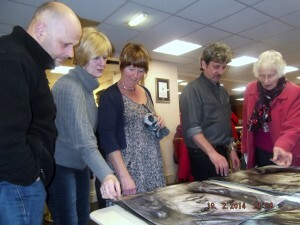 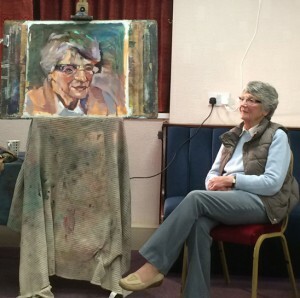 Marian Dutton demonstrates her ‘Healing Art’. 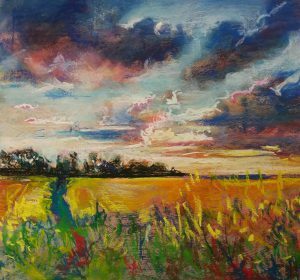 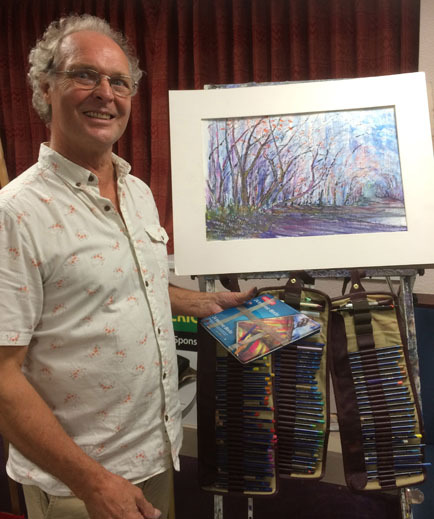 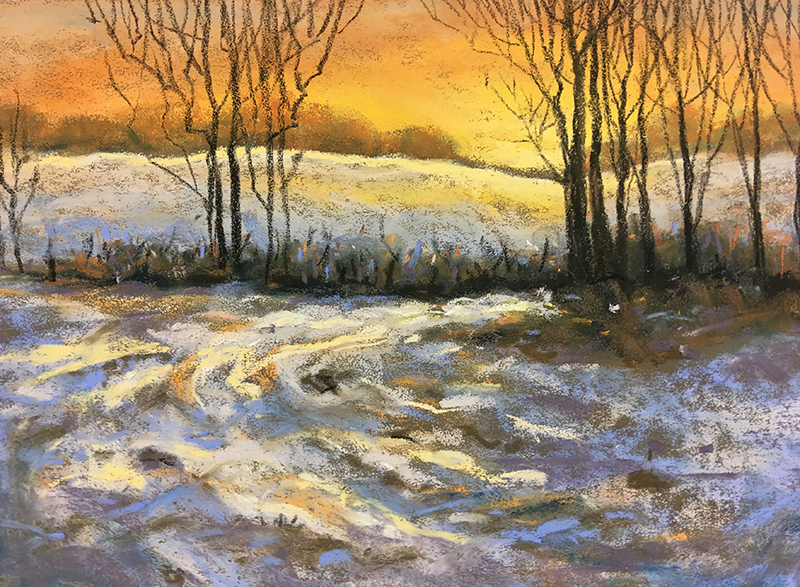 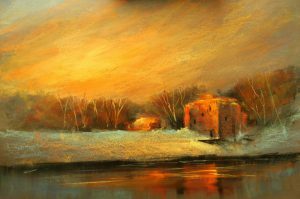 Members were treated to a demo by Les Darlow on how to a produce a vibrant sunset in pastels. 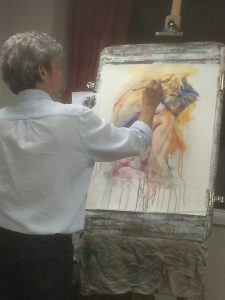 Working from dark to light, it was fascinating to see his amazing technique take shape before our eyes. 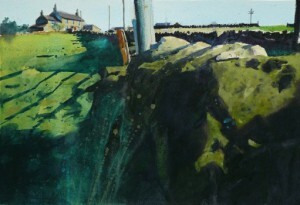 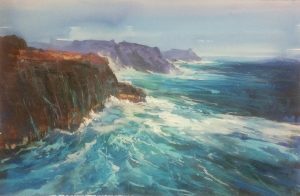 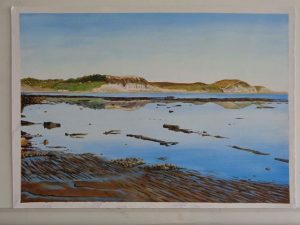 Peter Woolley entertained us with his humour and his well-explained water-colour techniques and produced one of his delicate studies of a rocky landscape before our very eyes. 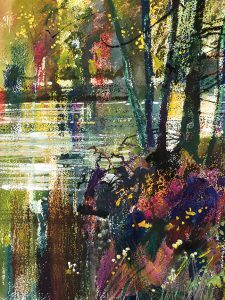 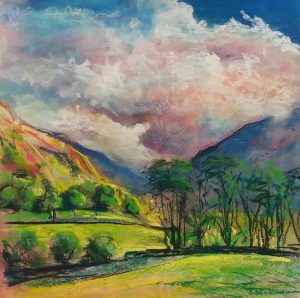 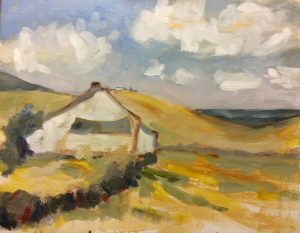 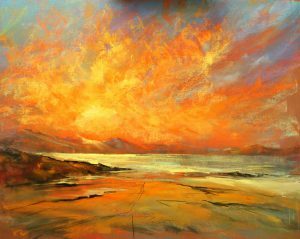 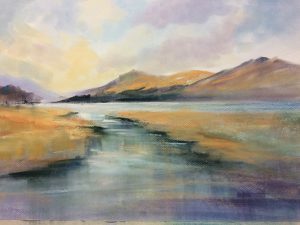 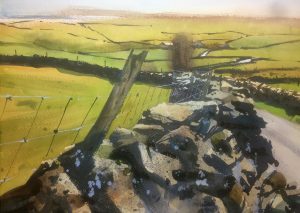 On Saturday 9th April Tracy Levine, reknowned Cumbrian artist, came to Lodge Artists HQ in Brinscall for a full day workshop on landscape painting in acrylics and mixed media. 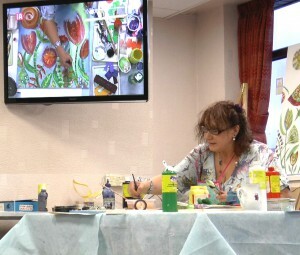 As always the group had a wonderful day, learnt a lot and produced some great experimental work. 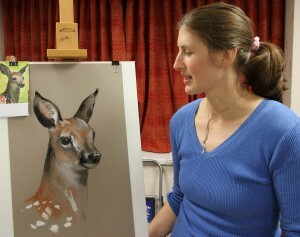 Elise used pastel on mount board to produce this very nice portrait of a fawn. She explained how to create the eyes of different animals, drawing on her studies of animal behaviour over 4 years. 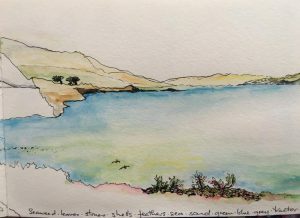 She also produced a horse study in pen and wash. To follow up she sent her tips on eyes by email, and is also calling in to see how members get on this week putting it all into practise. 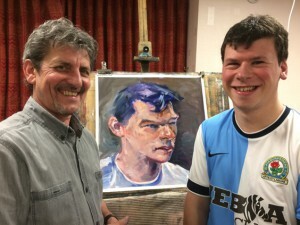 Anthony Barrow – two fabulous portraits in one session! 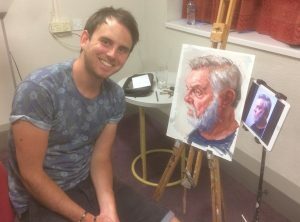 Anthony Barrow was with us again this week to demonstrate painting a portrait in oils – and he produced two great pieces of work which the models were thrilled with, especially as he gave them the paintings at the end of the evening. 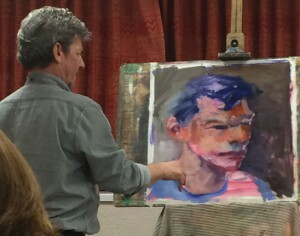 Next week we will be trying out his techniques for ourselves. Great inspiration. 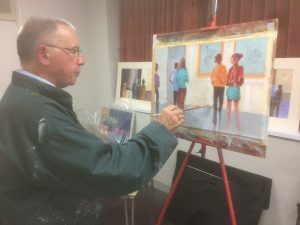 Member Chris Oakden showed members and guests his techniques and tips for painting figures – how to mix colours, identify planes and create a good composition. 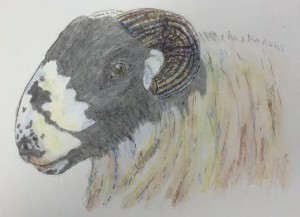 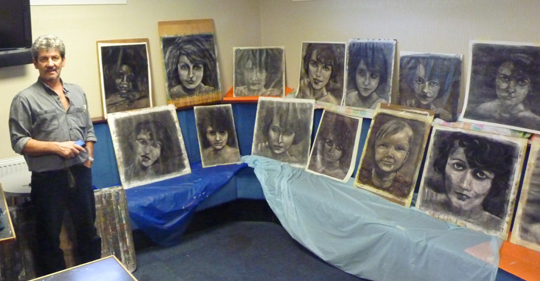 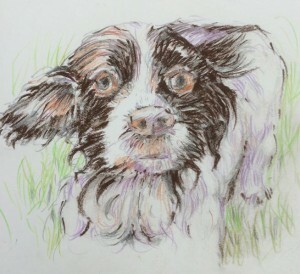 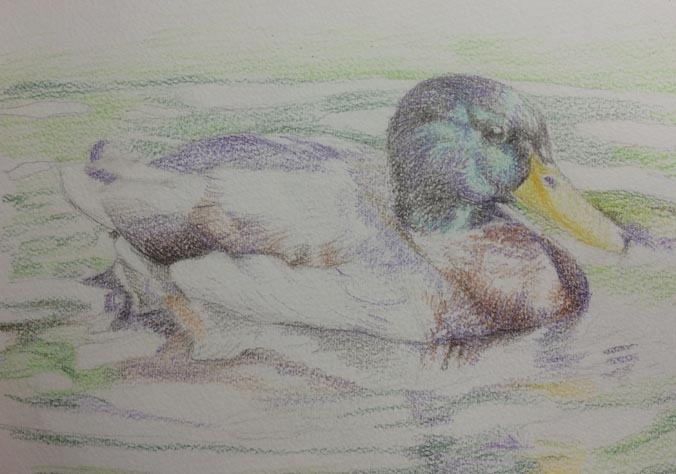 Following the demo by Joanne last week, members produced some sketches using graphite and coloured pencils. 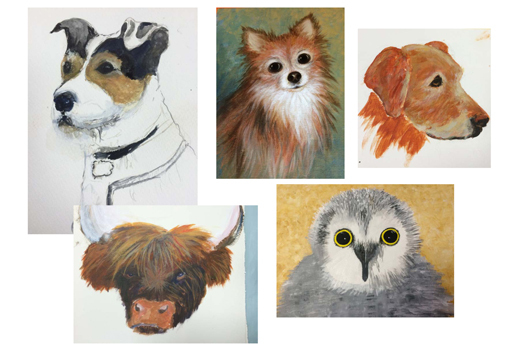 The following week members tried to put into practice what they had learnt! 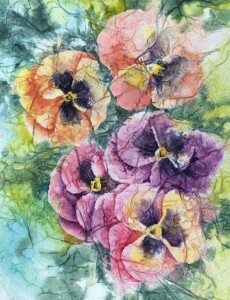 Using tissue paper applied to stretched watercolour paper, Ruth showed us how she mixes her colours and then produced a delicate painting of pansies with a ‘batik’ effect within the two hour demo. 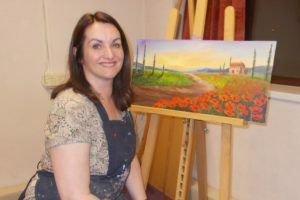 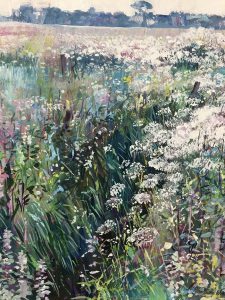 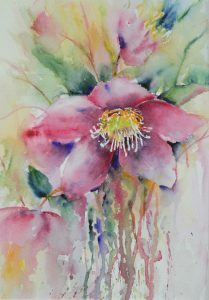 She then kindly donated the painting, which will be raffled for charity by the Society at their forthcoming exhibition in The Farmhouse Gallery ‘Blooming Beautiful Brushworks’, on a floral theme. 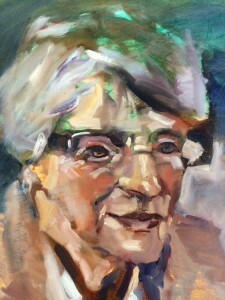 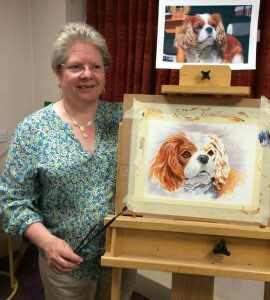 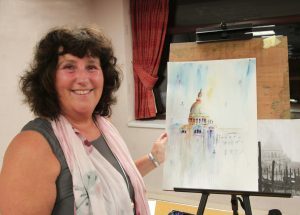 Gail McArdle gave Lodge members a demonstration of her own special techniques, which she uses to produce colourful semi-abstract paintings of birds and flowers, and came back to give a practical a workshop the following week. 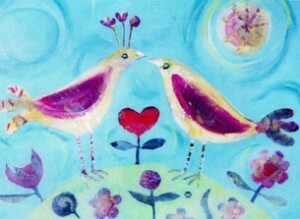 She creates simple shapes and paints loosely onto a painted background, then adds texture with assorted media and tools. Finally she cuts in to refine the shapes to great effect. 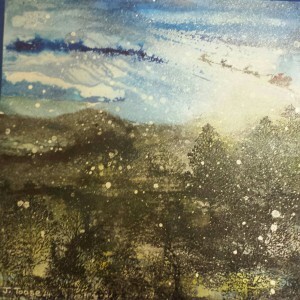 Janet gave a demonstation of her techniques to produce abstract paintings created from ‘happy accidents’ using such materials as car spray, rubber stamps, wax crayons, and glitter pens along with traditional painting and drawing techniques. 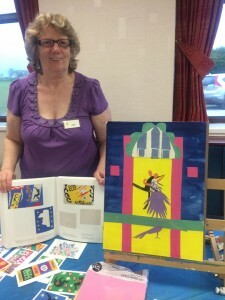 Armed with cutting board, pencil, Stanley knife and ruler she looks carefully at the large pieces of work she has created and cuts out areas that work in isolation, often turning these into unique and original greetings cards. 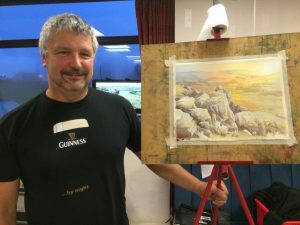 On another entertaining and informative visit to Lodge Artists, Harry gave members a step-by-step demonstration of his techniques and style of oil painting, creating a dramatic sky and seascape, all within the time frame of under two hours. 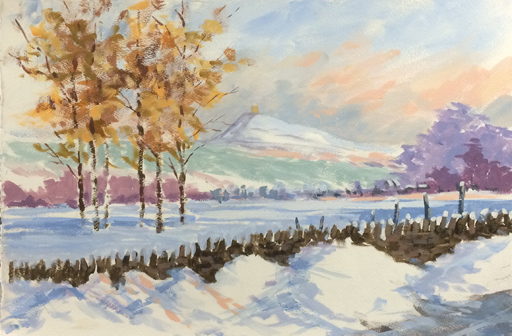 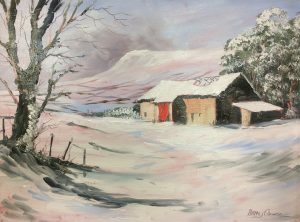 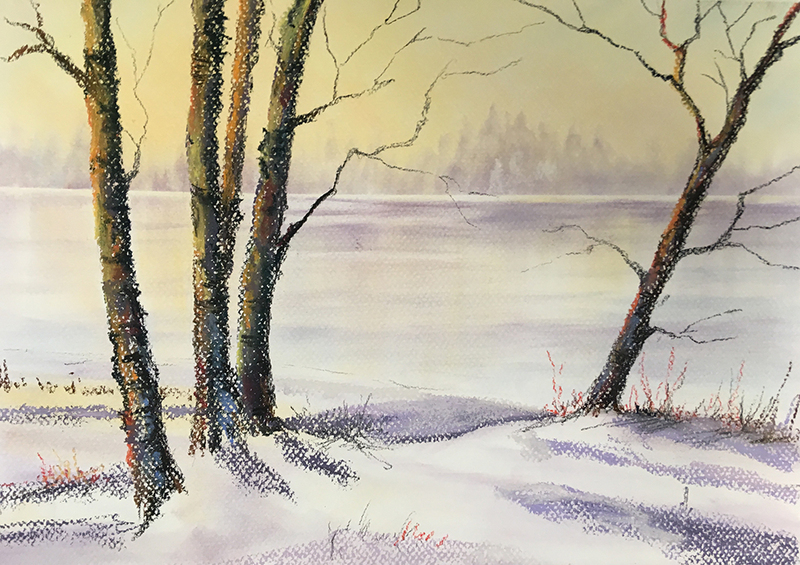 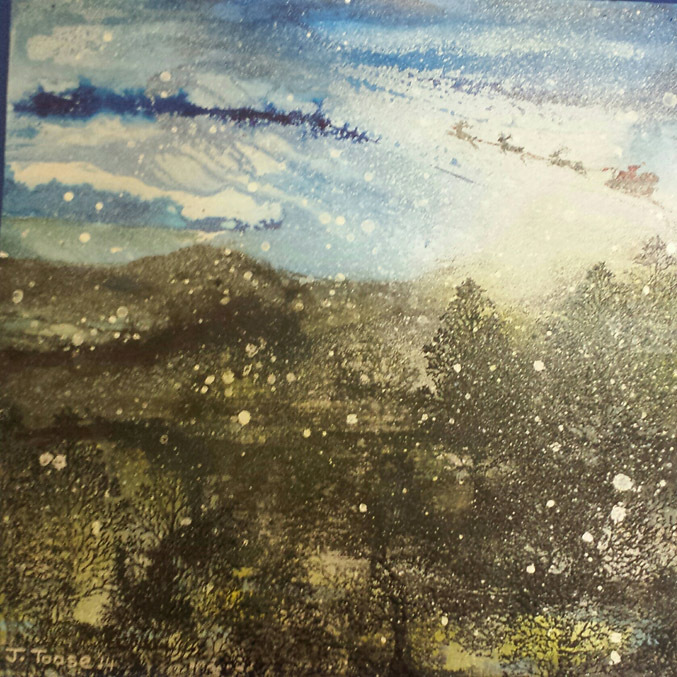 Lodge members were treated to an expert demonstration by Gerry Halpin of his style and techniques using acrylic paints at the meeting last night, and this delightful snowy scene in Rivington took shape before our eyes. 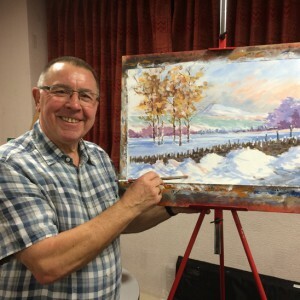 Lodge members were so impressed with a demonstration given to the Society earlier this year by Tony Barrow, that they asked him to come back to do a Workshop, so they could try out his techniques, and benefit from some hands-on guidance from him. Pictured here with some of the members who took part, Tony was entertaining as always and created the dramatic portrait shown below on the day. 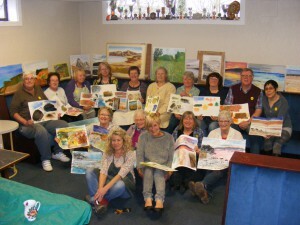 Tony Barrow (2nd row left) with Lodge members last Saturday. 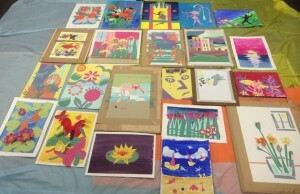 The resulting paintings by members. 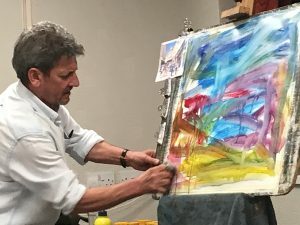 Lodge member Chris Ogden gave us some insight into the unique technique he uses to produce stunning paintings full of colour, pattern and three dimensional imagery. 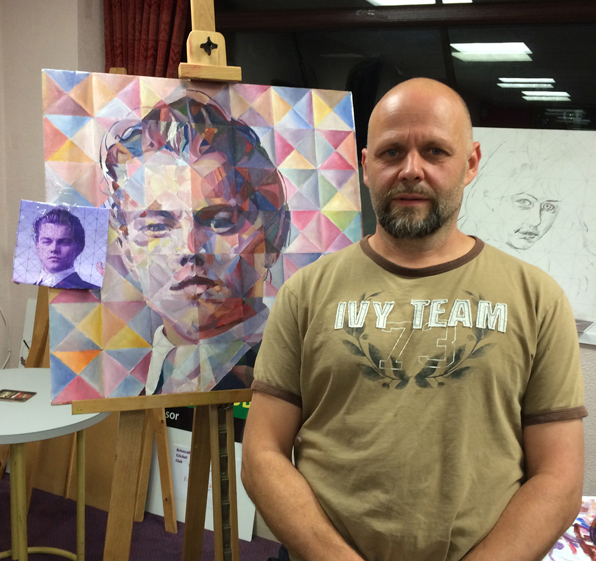 He was working on one of his latest paintings – a stunning portrait of Leonardo de Caprio, shown here. 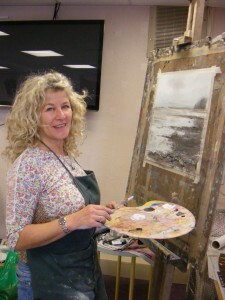 Alyson says ‘go with your gut feeling’ and do it your way! 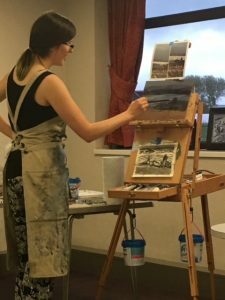 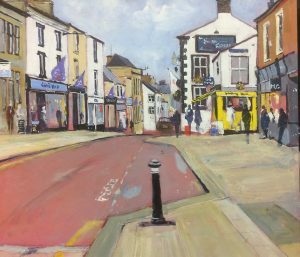 This week saw a demo by Alyson Telfer giving her own very personal slant on painting and what it means to her, how she works and why. 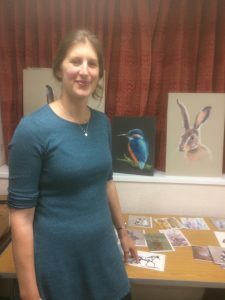 We saw two very different styles of work taking shape in front of us – one with very loose brush strokes depicting birds in flight and another (shown below) building up layers of detail using acrylic inks, a pen and brush and her own very effective ‘dot’ technique. 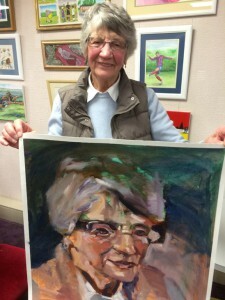 The society are now looking forward to trying out some of her very inspiring ideas. Lodge Artists member Sue Barnes inspired members to create their own tribute to Matisse and his unique style and methods, using paper cut-outs, in his later years. 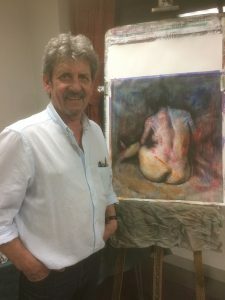 Having visited his exhibition in London, Sue was able to pass on her enthusiasm and ideas about his technique and the result was the vast array of colourful and imaginative pieces of work, shown here. 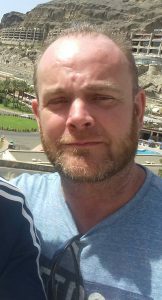 Terry Harrison – did he mention his new book? 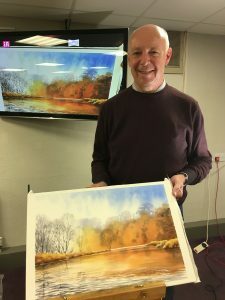 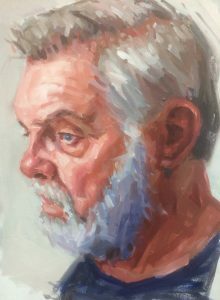 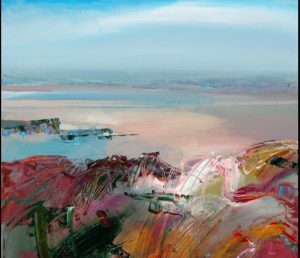 This week we experienced ‘vibrant pastels’ with Duncan Ibbotson who gave a detailed briefing of how he approaches painting, with a step by step insight into the production of a piece of work in his unique style. 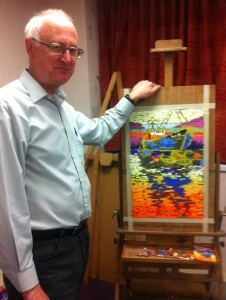 He promised to send us a copy of the finished painting which was taking shape before our eyes. Very inspiring. 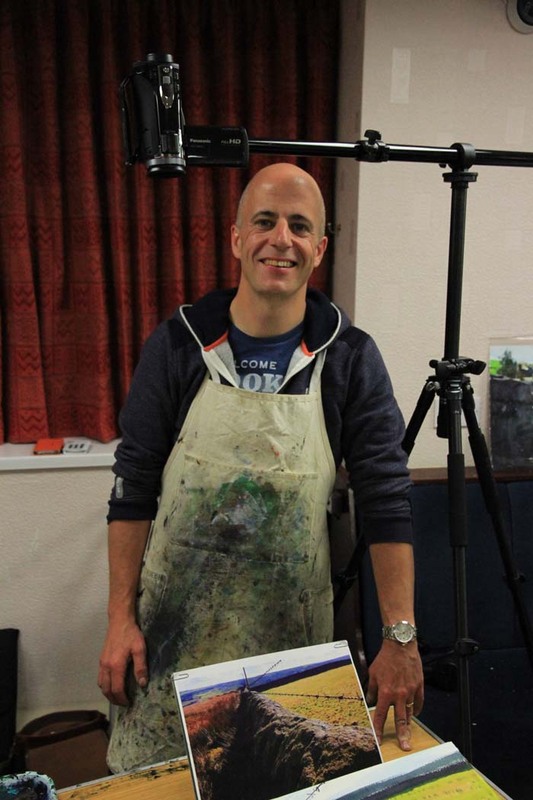 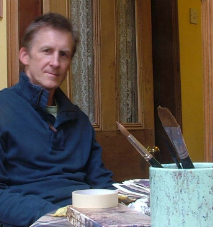 Rob Edmonson on water, finding your own style and ‘making marks’ with paint. Rob gave us a fascinating demonstration of how he approaches painting and some helpful tips and techniques to achieve special effects using acrylics. 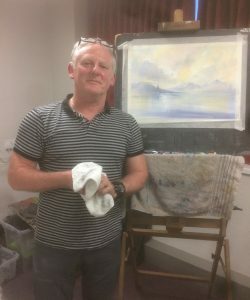 After teaching painting and ceramics for 39 years he is now enjoying travelling and gathering inspiration for his painting. Next week the group will be having a go!